I wrote this article for the Cottage Museum in Woodhall Spa, where an exhibition about prefab life opened this week. I now know that the thousands of prefabricated houses which sprang up after the second world war were Churchill’s response to the housing shortage caused by that war, but all I knew at the time was that something exciting was afoot. Until 1947, when I was four, we were a family of four living with two of my mum’s half-sisters and their families in a rented house in Stonebridge Park, near Wembley. It seems we qualified to be rehoused on a prefab estate being constructed under Churchill’s scheme, probably because of the overcrowding and the fact that my dad was a returning serviceman. Memories are elusive, and it’s difficult to disentangle genuine recollections from received accounts, mainly from my parents and other relatives. However, I am fairly certain that an image I have always had in my head of jumping in and out of frozen ruts in a muddy field must have been something to do either with visiting the site of our new home before it was constructed, or perhaps later, after we had moved in. This fits with the records of the terrible winter of 1947. 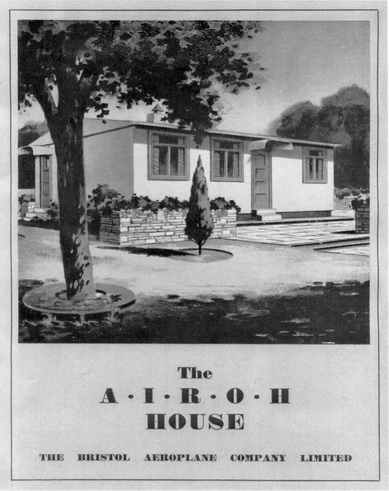 My next memories, which are much clearer, were to do with my mother’s reactions to the prefab itself, which I have now identified as one made by the Bristol Aeroplane Company, called the “Airoh”. At our old house there was no running hot water so baths were taken in turns in a zinc bathtub in front of the fire, filled with hot water from kettles. I can’t remember the toilet or cooking facilities, but I am pretty sure they were not a bit like what met my parents’ eyes when they first moved into No. 36 Pilgrims way, NW9. I do remember my mum being in fear of the electric cooker (a Belling I think,) and we were all overawed by a big red switch and something called a bathroom, which also had an airing cupboard, a flush toilet and a wash hand basin. All in one room! The big red switch, which was jealously guarded by my dad, turned out to be something called an immersion heater. Our prefab was at the end of a row, so it had two doors, one at the front, and one at the side, opening straight into the kitchen. Going through this door was must have been like entering a spaceship, with the electric cooker, a kitchen sink with two taps, and (later on) a fridge. There was also a scullery (aka press) for storing food, and an internal window between the kitchen and dining / living room. The fridge just arrived one day, filling a gap which I had wondered about. My mum did bring with her a deal kitchen table with a combined wringer, obviously for practical reasons, but perhaps also as a statement of defiance in the face of all this new-fangled technology. The estate was built on green belt land between Kingsbury and Wembley Park, on Barn Hill. The nearest shops and school were in Church Lane, Kingsbury, about a kilometre away. Obviously we did not have a car (few did,) so my sister and I walked to school, initially with my mother, later in a gang of kids, unaccompanied. Changed days! I do remember being kitted out with a Balaclava helmet, knitted by mum, which froze to my ears, and getting terrible earache in the winter, but I still look back fondly on this period of pioneering living. Our prefabs were assembled on brick and concrete bases, using factory built modules literally bolted together. When we moved in, work on the infrastructure was still going on, mainly finishing the roadway and footpaths. The labour force was a couple of German prisoners of war, supposedly supervised by British soldiers. We kids were strictly instructed not to fraternise with them, but of course we did, as the squaddies seemed to be notable by their absence. One of the POWs smuggled toys to us somehow, and I remember with affection the tiny metal tractor that came my way. I like to think now that he had children of his own back home whom he must have missed, and that we brought some joy into his life. I am sure I carry with me the legacy of those days, in terms of my abhorrence of waste and belief in the value of ingenuity. I remember for instance that there was an Anderson shelter at the back of every prefab, used by many to store coal. My dad came up with the idea of building a lean-to coal store at the side of our shelter, so as to free it up for use as a shed. The idea was good, but the problem was, no bricks. He had noticed that surplus bricks were to be had though, no questions asked. Next problem, no wheel barrow, so he just set to and built one out of an old pram chassis (maybe our old pram!) and a large wooden box. In those days scrounging ruled, OK.
Part of my motivation in researching prefab days has to do with the randomness of the estate’s social mix and its consequences (Coronation Street has nothing on Pilgrims Way,) and the fact that house prefabrication still thrives in various parts of the world, possibly a valid response to current housing shortages in the UK. The enforced social melting pot was evident early on, as a tenants’ association seemed to spring up, I know not how. I later gathered that the idea was to foster community pride on the estate and to organise various collaborative events. The first of these that I recall was a gardening competition. My mum was a keen and inventive gardener, concentrating on vegetable growing to her dying day, and in those days much given to the collection, processing and application of horse manure. I think she was bitterly disappointed at not winning at least a silver medal, and scornful of those pesky flower growers who did win prizes. The horse manure obsession had its drawbacks, especially for me. It was randomly delivered daily by the horses who pulled the milk float, so when the milkman came round residents would be waiting with bated breath in case the load was deposited outside their prefab. This must have been problematic though as not all of the prefabs gave directly onto the road, and competition must have been fierce between each side of the road anyway. Once successful, my mum’s favoured method of allowing the manure to rot was to liquefy it by diluting it with water in a zinc bath. 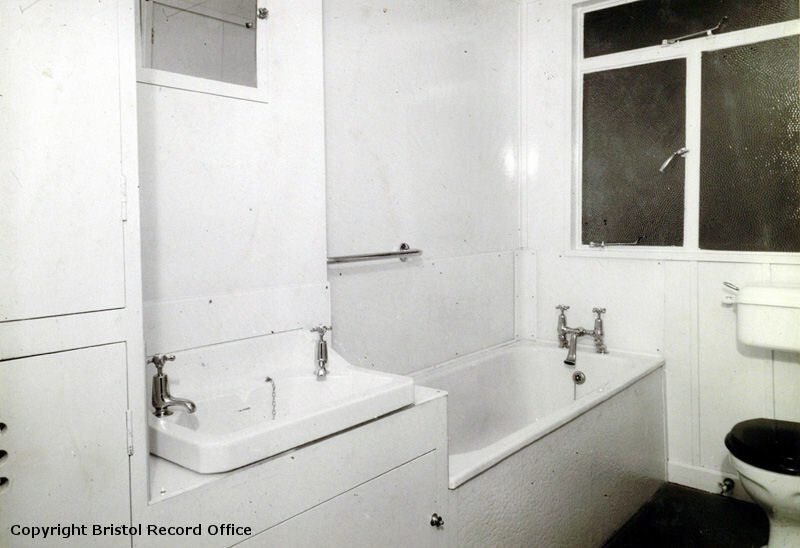 Probably the very same wartime bath we used in the old house, and definitely the same one I fell into one fine summer’s day when being threatened with the hosepipe by my Uncle Fred. This memory is not a received one, especially as it was followed by the ultimate humiliation of having to wear my sister’s knickers in lieu of swimming trunks. Ho hum. A much more prestigious event organised by the tenants’ association was the street party to celebrate the new Queen’s coronation in June 1953. The tables were set up just outside our end-of–row prefab, which was handy. My memories of the day were the slight problem of navigating deep holes dug in the road for some reason, a stupid boy eating live beetles to show off, a display by the Haarlem Globe Trotters basketball team, and being bored by the ceremony itself on television in a neighbour’s front room – probably the only TV set on the estate. (Black and white, 405 lines, of course.) You will have seen the footage. Little did we know at the time that we were harbouring a future Rock and Roll idol. Charlie Watts, Rolling Stones drummer-to-be, lived up the road from us, and one day he appeared at our side gate waving a gun, toy I hope, declaring something like “hands up or I’ll fill you with slugs”. I was not too worried I guess, but a bit revolted by the idea of being splattered by garden slugs. So hands up it was. I did meet Charlie years later when he was playing in a blues band in Wembley, just on the cusp of fame, but I didn’t have the heart to mention the slugs. My sister reminded me recently that one of the accidental benefits of prefab life, for us at least, was the semi-rural setting, with trees, a pond and what seemed like open country, all within walking or running distance. We learned to climb trees, have adventures and fall through the ice on the pond, unsupervised. Surprisingly perhaps it was a happy childhood while it lasted. By the way, my father’s ingenuity was eventually his undoing. The problem was that the prefabs only had two bedrooms, and as we grew up, the bedroom I shared with my younger sister was perceived as inappropriate. My dad’s solution was to build a timber and hardboard partition in our bedroom, giving us a degree of privacy. I don’t know whether he knew that alterations were strictly forbidden, or whether he would have cared if he did, but there followed two unintended negative consequences. The first was that word got around about the famous partition, so neighbours came around to have a look and see how it was done, and he cooperated; he might have got away with it otherwise. The second snag was that this turn of events played into the hands of his arch-enemy across the street, and though we could never prove it, she probably took pleasure in reporting him to the council. Even without this complication, we would have had to move out sooner or later. The post war prefabs were always regarded as a temporary solution to a short term housing problem, and the idea was that families could go on a waiting list for permanent housing in the area if or when they wanted to leave the estate with good reason. Our charmed prefab life ended when we moved onward and (literally) upward in or about 1957, to a new life in a dismal council flat. As far as I recall the coal bunker was still intact, a fitting monument to post-war survival techniques. I believe the estate was demolished in 1972. Not bad for temporary housing. 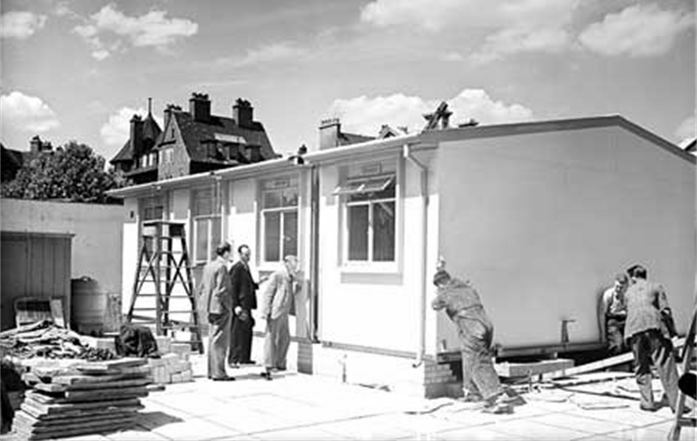 Click here to watch a 1948 British Pathe film about the construction of a prefab in Hertfordshire. It looks to me like an Airoh. The Airoh, made by the Bristol Aeroplane company was constructed out of aluminium and was generally reckoned to be top of the range. Aluminium was used because aeroplane manufactureres such as Bristol had a lot left over after the war. 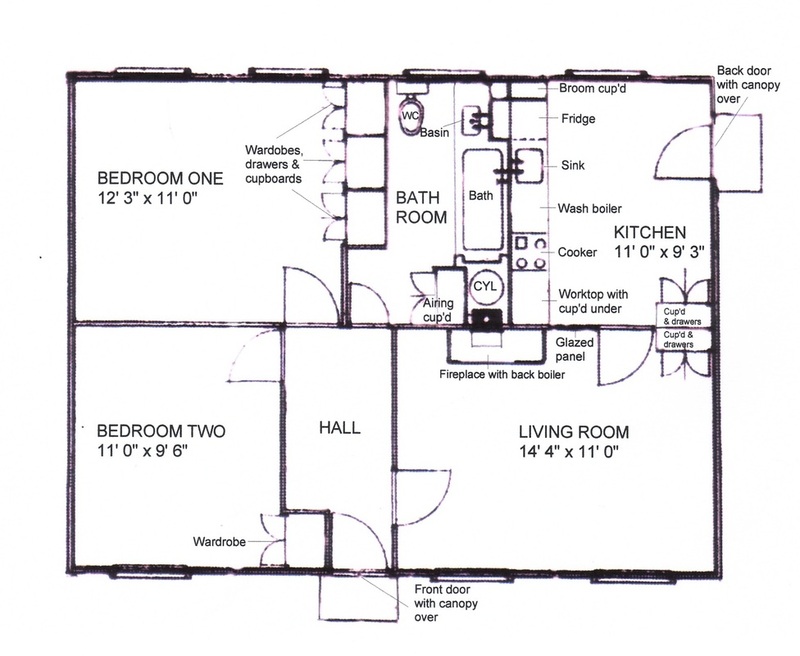 Floor plan of the Airoh prefab. 54,000 were made, each costing £1,610. Click to view in a new window. The Airoh bathroom. Bit of a change after the zinc bath in front of the fire. Me (right!) 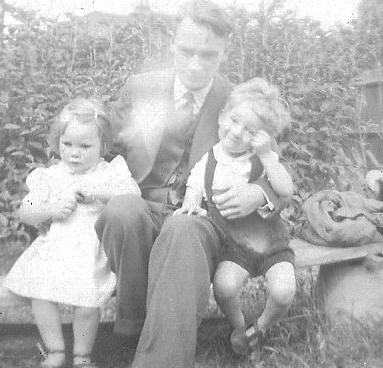 with my father, Henry, and my sister Janet, probably taken when we lived in the prefab. Photo found recently in an inherited biscuit tin. This entry was posted in Memoirs and tagged Barn Hill, Churchill, Kingsbury, NW9, prefabs, Wembley by peterdewrance. Bookmark the permalink. Glad you liked it – plenty more to come! Like Roseanne, I enjoyed it. But I’m puzzled. I believe I remember that prefab – but I have no memory of the council flat, which is odd – since I didn’t take off for Australia until Christmas 1956, by which time you would have been in the flat and we would have been acquainted for about two years. Ivan S.
Thanks Ivan – glad you liked the story. I never was too good at dates. I think you are right. I started at KCGS in 1954, when we would have met, and I recall travelling to school by tube from Wembley Park to Kingsbury, having walked there via The Paddocks, so that makes sense. We must have moved to the flat in 57 I guess – I’ll check with my sister. I got an email today from a fellow Fryent Primary alumnus who has read this post: “Thank you very much Peter for your post “Prefab Days” – really interesting. I hadn’t realized that you lived in the prefabs or that you even went to Fryent School…….My friend Pat, who lived a few doors away from us ……..said that his mother used to say to him, “Whatever you do, don’t play with those Pilgrim Way kids” !! Great article and lovely memories. Makes me smile when recycling these days is seen as something relatively new. Enjoyed seeing a young Charles Hawtrey and Megs Jenkins, too. I loved this article. Until I was 2, and then again from 5 to 7 years old, I lived in a prefab in Winchester. I remember the second one vividly. It was an amazingly well designed little house with a proper garden and I still miss it. I still feel sad that they were demolished. Tell me more Diana! I am going to write more on the subject, but if you would like to write a guest post about your prefab days, just let me know, either as another comment on this page or via the contact form on the about page. Love to hear from you. Hi Vic. I’m afraid I don’t remember you, but I do remember the green thing – it was just outside our back garden. Our Dad tried hard to keep me and my sister off the street, but we used to sneak out quite often. Do you remember the Watts family – as in Charlie Watts, Rolling Stones drummer? Thanks Wayne! I do remember Peter Harrison, we lived next door. He was a wild child. Do I feel a Pilgrims Way reunion coming on? Thanks Paul – yes I’m very interested in your Pilgrims Way stuff – I’ll email you direct. Paul sent me the link to this website, I was born in Pilgrims Way No. 28. My name is Shelagh O’Mahoney my sisters were Maureen & Colleen. I have many fond memories of my childhood there. I knew Peter Harrison, I thought Madeline Williams lived one side of him, and until approx. 1960 the other side was the Paynes who emigrated to Australia Linda, Stephen and Raymond were the children. I also remember the Kings Drive flats, as a child we had the school coach which took us all to Fryent School, My mother was the treasurer and therefore it fell upon me to go round both the estate and Kings Drive and collect the coach subs. I also remember Vic Burton and where he lived. There were many characters living on the estate, it was I feel an enchanted childhood, always some children around to play with. We had a very active residents association who would regularly organise trips parties etc for the children. I am very interested in any information on Pilgrims way. If I can be of any help, please email me. I remember your family, and Madeline Williams. I thought she and her mum lived at the far end of the row behind us and Peter Harrison. Next door to her were the Flicks and behind us were the Chignells, who were the only ones with a TV! You’re right, it was an enchanted childhood. Hello Peter. I am so pleased to have found this website. I lived at 95 Pilgrims Way, from roughly 1968-1973. We moved here from Paddington, and as i continued with going to my school near Edgware Road, I like one of your other posters, walked up the Paddocks to Wembley Park underground. I have some photos from that era which I will gladly scan and post if I can. 2 distinct memories, One is the red Phone Box located just near the footpath gap leading to Fryent Way. the other is the day that we had a small herd of cows wandering down the road having escaped from a nearby field. Hi Rob! I’m glad I wrote it. I think we had moved out by 1968 – in fact I had emigrated to New Zealand by then. I would be glad to take you up on the offer of photos – they are so hard to come by. I’ll email you so you can send them as attachments. Now you mention the phone box, it does ring a bell (lol) and I know where you mean. Any photos of the cows incident? Do stay in touch. Hi Paul – not so far…….